HSI maps and overlays are just one of the new features in Garmin's G1000NXi upgrade for the Citation Mustang. 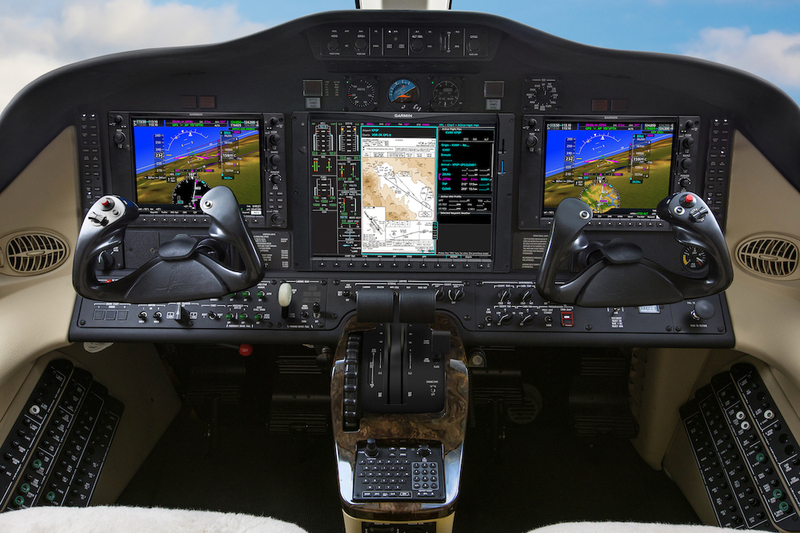 Garmin’s G1000NXi upgrade is now STC'd for the Cessna Citation Mustang and available for installation by Textron Aviation service centers. The upgrade modernizes the flight deck with new LED-backlit displays with faster processors delivering improved startup time and faster panning and map rendering as well as more brightness and clarity, lower power consumption, and better dimming performance, according to Garmin. The Mustang’s upgraded PFD can now display the NXi’s HSI map. Among the overlays available for the HSI map are Sirius XM weather, ADS-B In (FIS-B) weather, weather radar, Garmin SafeTaxi airport diagrams, traffic, and terrain. The FIS-B weather requires optional ADS-B In equipment. G1000NXi can display VFR and IFR charts. Pilots can also use split-screen features to optimize the PFD and MFD layouts. Garmin’s SurfaceWatch is included, adding runway monitoring technology so pilots receive visual and aural cues based on the flight plan, warning of takeoff or landing on a taxiway or a too-short or wrong runway as well as distance-remaining annunciations. The upgrade adds visual approaches to the procedures menu. This feature creates a three-degree glideslope from the runway threshold that pilots can use to help ensure they are landing on the correct runway. Pilots can set minimums for a visual approach and then choose vectors or a straight-in intercept and also fly an autopilot-coupled visual approach. G1000NXi includes Connext cockpit connectivity, with Garmin’s Database Concierge making uploading database updates much easier via the Garmin Pilot mobile app and allowing synchronizing of flight plans between the app and the avionics. Connext also sends avionics information to Garmin Pilot, FltPlan Go, and ForeFlight Mobile including traffic, weather, GPS position, and back-up attitude.